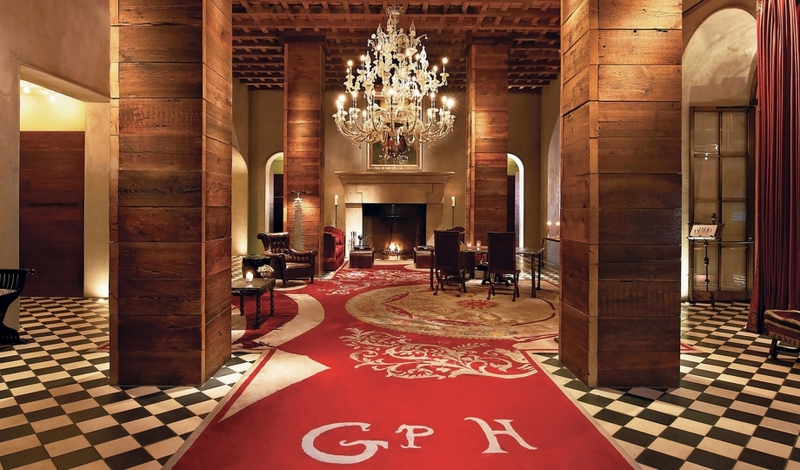 Entering the lobby and public space at the Gramercy Park Hotel is much like stumbling into a Bohemian artist's studio. The vivid and operatic display of seemingly haphazard combinations of surreal contemporary and centuries-old furnishings create a style that is akin to stepping into a real life painting. Large canvases from various artists have been placed upon walls of richly-textured rough white plaster. Black and white Moroccan tiles covered with specially designed red hand-woven rugs cover the floors here. Large support pillars of reclaimed wood give the lobby and seating area an old-world atmosphere dropped amongst the more arty overlook. At the very end of the area is a hand-carved 10' Italian fireplace in front of which is a lush, red velvet couch, while a custom Venetian glass chandelier hangs above. So as not to detract from the extravagant view of the hotel, the front check in desk has been settled into the wall at the left side; enough to be seen but not enough to stand out against the otherwise breathtaking room.